I do love a weekend when we don't have anything on, I can do what I want whenever I want. Of course I'm referring to my sewing. I love waking up on Saturday knowing I've got all day to play in my sewing room. I love making little displays in my room, here is one of them. I found a sweet wire basket at the shops but it was a bit small for quilts so I put my table runners in it. I like the look of rolled up quilts. On Saturday I made a little fabric basket to have out on display. This is Little Ruby fabric by Bonnie & Camille, I have collected all their fabric ranges since Bliss. I folded up my layer cake squares and stired them int he basket. Isn't it pretty!! In the evenings I like to have some hand sewing to work on, the last 2 weeks I have been stitching this Gail pan design, Its ready to be quilted now, This pattern is going to test my hand quilting skills. 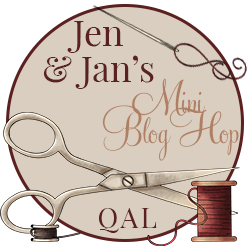 I'm not keen on hand quilting but I'll give it a go. You may remember last week I shared this quilt and said I was making it for our son Jacob, Well I'm still making Jacobs quilt but this one isn't his. its MINE. A very special friend is sending me some USA patriotic fabric to use for the remaining flags in Jacobs quilt so while I'm waiting for that to arrive I decided to make another quilt for me using all my Bonnie & Camille fabrics, I have 15 different navy fabrics and 15 different reds, I love it. The blocks are so quick to make. I did all the cutting out and then each day sewed a few blocks before I went to work. I can go to work today satisfied I got lots of sewing done over the weekend and even a few things finished. That is the best kind of weekend. Everything looks so lovely Leanne, especially your Irish Chain quilt. 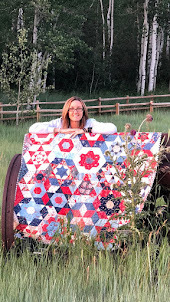 Your USA quilt is very nice Leanne, love to see Jacobs quilt when it's finished. I have lots of projects for the moment. I'm trying to make a blue quilt by machine.